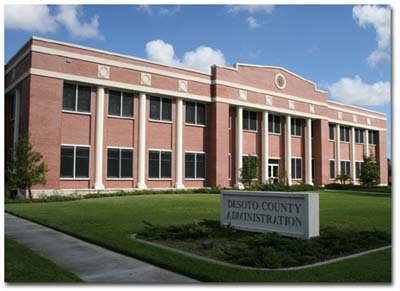 The Property Appraiser of DeSoto County, Florida is charged with placing a fair and equitable market value on every parcel of property both real estate and tangible in our county. Many people believe the Property Appraiser determines the amount of taxes a property owner will pay but this is not the case. The job of property appraiser is to value property for tax purposes; the taxing authorities (Board of County Commissioners, School Board, City Council, Water Management) set the tax rate for all property and therefore the amount of taxes to be assessed. Other responsibilities of the Property Appraiser include the administration of exemptions (homestead, widows, widowers, blind, disability and total exemptions), maintenance of property ownership records, and maintaining aerial photographs of the county. More information is available concerning exemptions at other sites within this web site. Our goal is to serve the people of DeSoto County with outstanding customer service. The information contained herein will be regularly maintained for your benefit. Your comments and suggestions are encouraged, as we will continue to enhance the site's features. Please feel free to come by the office if I can ever be of assistance.